Alison Jones: I’m here today with Malcolm Durham, who is a former finance director, founder of Flexible Directors, and a serial entrepreneur. 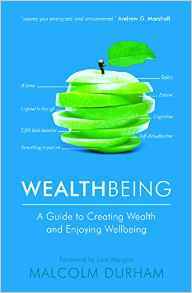 Wealthbeing, which is the book we’re going to be talking about today, it’s the book of a movement, really. It’s all about balancing wealth and well being. Welcome to the Extraordinary Business Book Club, Malcolm. Malcolm Durham: Thank you for having me. Alison Jones: It’s lovely to have you here. Tell me a little bit about how that title, Wealthbeing, came about. I love it. It’s such a great portmanteau word. What do you love about it? Malcolm Durham: I’m somebody who’s always trying to find connections between things, and I love joining stuff up, and I love summarizing things on a page. I wanted to capture the essence of what I was about, why my life, certainly to date and hopefully going forward, is about. I’d sold my family’s building business for what I considered to be four times what it was worth during the boom, just in February 2008 before it got back to somewhere near normal. I recognized that prices were highly inflated and managed to capitalize on it. Getting there had been a struggle emotionally. I was catapulted into being chairman of the family building business and had to deal with a lot of responsibility there as well as being finance director of a public company before the age of 30. I wasn’t fully equipped to do that. I wonder who is, so I had to learn the tools and techniques which I think sit easily under the umbrella of emotional intelligence to get myself through and to get to a pretty good place. In the years between then and now, partly through writing the book and through allowing all those feelings and thoughts and triumphs as well as disasters to ferment, to come through into where I am now, to get to a very good place. I think what has happened through history, that what we do is we share the stories of how we’ve been to places. As I’ve said on the back of the book, I’ve battled divorce, depression, other disasters, not so you don’t have to, because people will, but because when you’ve got a story as to how somebody else has dealt with it, hopefully some parts in the book will be a great help to you at the time that you come across something that you find is similar to it. I wanted to put the two things together. I wanted to say it’s okay to have wealth and it’s okay to have well being, and whilst the two sometimes struggle against each other, what we’re all looking for is to be able to have both, to be able to synthesize the two. The book is an attempt to do that, to show how you can create wealth and look after yourself, and that also involves learning how you deal with other people. It’s about dealing with yourself, about learning emotional intelligence, and about building a business. The first word I thought of was ‘wellth’, but then I’ve always got to spell it W-E-L-L-T-H. I thought a word that you have to spell is quite a long word: ‘wealth spelled W-E-L-L-T-H’, not so good in our fast moving world, so wealth and well being came together as Wealthbeing, and it worked. Thank you for enjoying it. When I was at the Business Growth Show a couple weeks ago, the word resonated. It’s a good word, and having been at Hay Festival recently and heard Simon Horobin talk about the English language, I’m going to submit it to the Oxford English Dictionary and see if we can get it into the dictionary now as a word. I hope people are inspired by it. They think this is a good idea. I hope that it encourages them to take that step from employment. The core demographic that I’m aiming at are people who are in employment a bit stuck there, and can’t see how they can keep the good things about that employment whilst getting the freedom, making a difference, meeting their other needs by setting something up that is more valuable to them and has a different set of challenges, but a set of challenges that they’re looking forward to. Alison Jones: Interesting. I had not a dissimilar conversation with Patrick McGinnis recently, who wrote The 10% Entrepreneur. We were talking about the way that it blends the entrepreneur ship book and the traditional management leadership type book by saying you can keep the day job and you can dabble in entrepreneurship. This is a new way of life. Yours strikes me as being similar in that interdisciplinarity, that kind of crossing of categories. You have the self help section in a bookshop, which is all about well being, and you have the business section, which is all about wealth creation, and there you are saying actually, it’s not ‘either/or’, it’s ‘and’. Malcolm Durham: I think Waterstones are about to create a section that is a crossover. I forgot what it’s called. I’d have to ask my publisher, Claire Christian at Red Door, what it’s called, but they’re recognizing that there is this starting to come together of people who are doing the same thing. I’m pleased that there’s another book in that vein, because one on the bookshelf all on its own would be great, but I doubt Waterstones are going to give me all that space. But 2 or 3 of us together ..
Alison Jones: Yes, and there’s a whole conversation there about metadata and standards and how you break classifications and how… yes. We’ll not do that conversation now, but it is a fascinating one. The other thing that really struck me about Wealthbeing, apart from the fact that… It’s a great word because you don’t have to explain it. I think that’s the litmus test, isn’t it? You get it. As soon as somebody says it, you’re like, “Oh, yeah, I see where you’re coming from,” and not every portmanteau word does that. The other thing is it makes a great hashtag. When you’re building a movement or a community, you want to be able to locate that conversation on social media. Malcolm Durham: Okay. I’m not a brilliant social media person, and my first challenge was that #Weathbeing is owned by an IFA, independent financial advisor, in Chicago. My hashtag is @YourWealthbeing, which I had to take as the next one. I’m interested in your wealthbeing rather than mine. Mine is my responsibility, and I’m hoping to guide you to yours. You’ll have to look for me @YourWealthbeing and encourage me to tweet. I write blogs, and they can be found on our website, wealthbeing.co.uk. Alison Jones: That’s your Twitter handle, the @. Malcolm Durham: My Twitter handle is @YourWealthbeing, yes. Alison Jones: Do they use the hashtag wealthbeing, because that’s a way of curating a conversation rather than naming your own account. Malcolm Durham: Please do. Please get started on it and please persuade me to do more social media. Alison Jones: I do know social media. I can see people who are listening to you are using that hashtag when they’re listening to you, so get in that conversation, absolutely. Malcolm Durham: Okay. Perhaps as an author, I like to compose things that 140 characters can’t get anywhere close to doing, darling. Alison Jones: Think of it as a haiku, darling. Malcolm Durham: As a what? A haiku. Yes. Go on. Alison Jones: There is a beautiful simplicity to the tweet. It forces you to articulate a single point really succinctly that I quite enjoy as an intellectual exercise sometimes. Malcolm Durham: Yes. 500 words is about as little as I can get to. Wealthbeing started at 20,000 words and it comes out at 60,000. Word counting is very easy nowadays. I thought I’d explained it all in 20,000, but it took me three drafts to get it up to explaining it to everybody else, because to you, the writer, it’s easy, but “What do you mean by this? What do you mean by that?” You’ve had to explain it more clearly, and that’s the process. Then you have to try and get it back down to where it can be, but it’s great to take people through, and each chapter, as you know, Alison, you’ve read the book, has got a leading title in it such as “When you’re launching it, bring something new to what you know” is what I want people to start with. Alison Jones: The titles worked really well. I love that numerical summary as well. You are, of course, a finance guy. You’re balancing what proportion of wealth and well being happen at each stage of the business. I thought that was a really neat trick. Very visual. Malcolm Durham: Again, I say business is easy until you put numbers to it. I’ve always thought that, and I went into accountancy because I was interested in business, how we create wealth. Without any wealth, there’ll be no health service. If we don’t create any wealth to pay taxes, we can’t afford the things that our taxes pay for, so it’s essential. How to do that is by making sure that you sell something for more than it costs, and that’s a numerical exercise. It’s also a people exercise, going back almost immediately to the emotional intelligence side. You do have to quantify things. You have to. Lara Morgan, who wrote the forward, who I’ve a great deal of respect for and has created an awesome business which she sold and is backing a lot of entrepreneurs now, she called the day when she had to do her finances Misery Day. Somebody as capable as that just hated finance, so she delegated it, of course. It’s that use of the term Misery Day that I home in on. People don’t like it. It comes straight to your thinking. “Oh, I’ve got to actually make it all add up.” I was having a great conversation with so-and-so and we were having brilliant ideas. Well yes, until you came to the idea of how much I’m going to sell my product to you to sell onto the next person, for example. The value chain analysis, as it’s called. That’s the difficult bit. That’s when it starts to get tough. That’s where there’s got to be a challenge. I kept numbers in there to make sure people, perhaps subliminally, I hope just get the message all the way through that numbers are important and numbers need to matter. You made the point, are those numbers different for different businesses? Yes and no. The point I’m making in the book, that the value of turnover and the value of cost of sales could be half of what I’ve put in there when I go from half a million to a million to five million, or ten times what it is, depending on the type of business it’s at. You will hit gross profits when you’ve taken the turnover of what you’re selling from the cost of sales of what it costs to make it down to a gross profit line, which then has a lot of commonality. When you get that amount of gross profit, you’re running the same size business as anybody else. A business with the same generic needs as other businesses, and that’s what I’m trying to illustrate, that that business should be spending roughly that amount in roughly those areas to grow itself. It should be starting with administration. It should be spending a bit on sales and marketing. I was trying to stop people getting ahead of themselves and thinking “I should be doing this, that, and the other.” If you find yourself saying, “But my business is different and therefore I need to do this,” okay, say that, but challenge yourself. The point about a guide like this is to give you something to test yourself against. For 20 pounds as opposed to the cost of trying and failing and making a mistake, which you’re bound to do, but making a mistake would cost you a lot more than that. Use what’s in there as a way of arguing with yourself, arguing amongst yourselves. “Wealthbeing says we should be spending 6,000 pounds on our website at the moment, and the guy’s come back with 36,000 pounds. Is it really 30,000 pounds better, more than it should be for us at this stage?” Think your way through it, and then you’ll come up with a much better decision for having tested it. It’s … What’s the right word? Not quite an acid tester. A benchmark. It’s a benchmark against which to test your decisions, not just financially but at the stage that the business is at. The other thing that I think is quite unique about Wealthbeing that I’d really like to bring out, if I may is once you’ve launched it, don’t go straight to expanding it. There’s a period in the middle that is a bit dull and boring and fairly stressful where you want to grow it, you know you’ve got something that works, but it won’t grow at the rate you’d like to grow it. It just doesn’t because other people don’t take it on to the same way that you do. I’ve launched Wealthbeing last September and our sales to date have been paltry and our tangible results to date have been negligible. I know that’s okay. I may be number 100 in Amazon. I was beating myself even more for being 250, 2,644, but that’s all books and that’s including fiction and everything else. In business books, I’m number 100-something. So be it. I’ve put in an exponential curve. We’re doing a podcast. I can’t draw it, but it is in the book. An exponential curve goes very slowly and then takes off at some stage later on, and the growth then becomes rapid. It’s understanding that, not the straight line. Simpler to understand this how I’d like the world to be approach. Alison Jones: That’s one thing I found really useful, actually. Certainly, when I started on my own business, I had lots of beautiful financial projections which were lots of fiction. It’s always much more emergent than that, and things don’t go in the neat lines either. Seeing your flexible models in the book, I found that hugely helpful. You’re right. The question I sent through to you was how do you balance the desire to make it specific with the need to keep it general enough to appeal to a whole lot of people? Which you’ve answered. Thank you. That was really helpful. 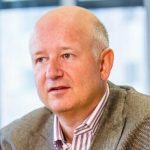 Malcolm Durham: Then it helps you to deal with uncertainty, because as Maslow says in our hierarchy of needs, one of the second lowest needs is safety. We need safety, and our debate about the EU is all about where will we feel safest, and the blog I’m writing at the moment is about this. When you learn not to feel safe, or to deal with lack of safety, you’re in a much better place, but we do yearn for that safety. Guides like Wealthbeing and the books and the sharing and the forums and whatever there is around, when you discover that there’s somebody in the same boat as you, life becomes more bearable. I have a colleague who’s feeling sick, got a serious illness at the moment. He goes to meet other people with those illnesses and discovers the people are much worse off than him. It’s not a nice thing to happen, but it’s comforting to know that you’re not in the worst place in the world. Wealthbeing and other books and guides and communities do that, and we’re creating a team of mentors, as myself, as David Eton, Rachel Stillwell, all available to mentor people and take them through this, and we’re offering an hour’s free mentoring to start with, and then £150 an hour thereafter to take people on their journey to wealthbeing. Alison Jones: This is another thing I wanted to ask you about. That’s another part of it. Wealthbeing as a movement, what are the component parts of that? Obviously the book is the flagship. You’ve got the mentoring scheme. How do they all fit together and what are the things that make a part of that movement? Malcolm Durham: I see it as a place. I see the book as the foundation. The family business is a construction business, and it was founded by my grandfather. Building is in my blood, albeit I’m not that practical. Don’t talk to me about DIY. But I understand the process of starting with good foundations. When we got jobs wrong, it was because we didn’t start right. We have a book that shows how to do it, and we’re living that book in the way that we’re creating wealthbeing. We’re also using a tool called strategy on a page. My colleague, Deri Llewellyn Davis who kindly reviewed the book, where you can put your key actions for the next 3, 6, 12 months to take yourselves forward. What we’re doing now is we launched, again, at the Growth Show. We’ve now got 200 followers. We’re keeping into contact with them. We are offering free mentoring to people to get them started for an hour. I’m mentoring a lady who is dealing with … Can I call it popularization of Irritable Bowel Syndrome? Helping people to deal with it. Again, creating a community. Alison Jones: It’s all the rage, isn’t it? Malcolm Durham: It’s not commercialization, but helping people to deal with it. Providing a knowledge base for that, and starting to show people the Wealthbeing way. It will start to flourish from there. I have got to a stage now where I’m not keen on grand plans, because, to some extent when I create a grand plan, failure is fine, but I’d rather not have more failures than necessary. I’d rather let it grow by responding to demand than creating demand, which is what you do in a small business. You see where people want you do go, and you respond. It may be that we’ll just sell a million books. It may be that we’ll have a hundred mentors. It’s likely that we’ll have 10 or 20 mentors, we’ll sell 1,000 books a year, we’ll have a show and a few seminars and maybe some master classes, and just responding, sharing the knowledge. As David points out, learning ourselves. A good consultant listens as much as they talk, two ears, one mouth, and we’ve got plenty to learn still. We want to learn from people how they implement Wealthbeing. It’s in the back of my mind that we’ll issue a second edition in maybe five years’ time to reflect what has happened between the original publication and what we’ve learned since then, and it will be what it will be. One of the things that we talk about in there is mindfulness, living in the present. The fact that wealthbeing is today almost enough. In fact, it is enough, and enough is another of my watchwords, as you know. Its existence today is enough. Alison Jones: Which very much captures the spirit of the time, I think. That sense that actually growth for growth’s sake is really not a goal. It’s just a mad chase after nothingness, and that sense of wealthbeing being the balance and the sanity check on that. Malcolm Durham: It’s worth mentioning, if I may, that it’s a community interest company, a new form of enterprise that’s been around in this country for about 5 or 10 years, I can’t remember exactly. It’s neither a charity nor a limited company. It’s in between those. It means that the asset can’t be sold on. I can’t sell it on, because as I’ve said, this isn’t here for me to enrich myself. It’s here as a gift to the world, if I may. But it can be run commercially, so we can sell books and we can pay ourselves for the time that we spend working. Again, it’s in that new middle space that has something for people to partake in, to everyone have a stake in it. Alison Jones: On every level, you’re walking the talk, aren’t you? Malcolm Durham: Yeah. I see you as a stakeholder now engaging with me in having this interview, and other people have a stake in it. Let’s take it where it wants to go, and I would like to have a community that helps each other. That would be the greatest thing. But it will be what it will be. Alison Jones: Tell me about your experience. How did it change you, personally or professionally or both? The actual writing of this book. Malcolm Durham: I discovered that I enjoyed writing. I see myself as a mentor and a writer, or a writer and a mentor, depending what day it is. When I write, I find it a challenge, but I find it mentally enjoyable. It’s the sort of challenge that fits with the concept of flow, which I mentioned in the book. A book by Mihaly Csikszentmihalyi, where it’s a challenge, I know the rules, but I get good feedback and therefore I find it very rewarding. I was half being writing a blog throughout the time that I was writing this book, and my blog on the Wealthbeing site, but also on FDSolutions.uk.com, which I write once a fortnight, shows people the links between what’s going on in the world now and the challenges facing entrepreneurs. I was getting good feedback on my blogs throughout the time I was writing this, so I was encouraged to continue writing and I found it rewarding. I want to do more writing, and my next project, which has been a year in the incubating, is to write a series of short stories around the different meanings of the word “Sorry.” My working title is Sorry, But You Really Need to Read This, which is the sort of thing that people will say. I’m trying to set it in the near future, when the business world, the world from the financial business perspective has changed slightly some, using what would happen if they … And it just became subject to a management buyout by the doctors and how that might look and various things around that, and amuse, entertain, and inform at the same time, so no big challenge there at all. Alison Jones: No, absolutely, that should be straightforward. Another way that the blogging was the gateway drug to the book. It’s so often the case, isn’t it? Alison Jones: Fail better. That’s a real mantra to live by, isn’t it? Malcolm Durham: It is, and I do keep quoting it. So, I’m getting a new PR person and obviously through Red Door, we’ve been connected, so this, hopefully, will also grow our footprint and get us better known in this very busy, ever expanding, enormous world that we live in. Alison Jones: It’s an important point you make, actually. I think a lot of people get very hung up on launch. The launch of the book, which of course is great and it’s exciting and it’s a big opportunity, but books have a long shelf life and you can continue to go back and re-promote and use them in different ways in your business and create new additions. You’re putting a real investment into the long term when you write a book. Malcolm Durham: Particularly a how to book like this, I think, yeah. Alison Jones: Fantastic. A lot of people listening will be in the throes of writing their first business book. What one bit of advice would you want to give them? Malcolm Durham: Don’t expect anything. Don’t think that this is going to transform your life. You’re not going to get rich out of it, virtually guaranteed that, so write what you want to write that’s honest and authentic to yourself, because what you will get, I guess it’s commonly termed kudos: “Oh, you’ve written a book.” As I’ve said, I’ve climbed Kilimanjaro and I’ve sailed around Britain, and I’ve written a book, so it’ll be interesting … I don’t know if we did a straw poll of which of those things people think is more impressive. It doesn’t really matter to me. They’re things that I chose to do. I’m never going to run a marathon. I do what I can do. Alison Jones: That’s the one I have done. Malcolm Durham: There you go. We’ve all done things. What am I saying? It’s something that you do. If you can do it, I’m sure you can do it, then do it. Write it authentically, and then get the help that you need to turn it into something good. Claire introduced me to Ian Shircore who edited it with me. I’d written three drafts by then, and he spent quite a lot of time on the introduction, because he thought we need to grab the reader, so he used the techniques of getting people interested and involved in it to start with. After that, his editing, I can say, was fairly light touch. He didn’t like my use of the word “whilst,” and he changed it to “while.” There you go. That’s fine. I thought you had to say “whilst.” He’s a professional writer of greater experience than I am, so I used that. Use people who have the greater skills to help you get there. Alison Jones: Be clear on your expectations, be sensible about your expectations, and get good people. Malcolm Durham: Sensible expectations. Yeah. Then enjoy it. Take the time to enjoy it. Again, it say in Wealthbeing, when you’ve got to a stage, give yourself a treat. Don’t change your lifestyle when it’s been published particularly, but have a meal out or a holiday or whatever feels appropriate. Just a one off experience. Alison Jones: This is a significant moment, isn’t it? It needs to be recognized. Malcolm Durham: Yeah. I’m not a fan of The Apprentice. I don’t think it shows entrepreneurship in a good light at all, but this fact that the winners get to have a treat is something that I do agree with. Anything I agree with in Wealthbeing. Alison Jones: Brilliant. I always ask people to recommend somebody. Obviously, I know a lot of people who come on this show, but it’s really good to have recommendations of people that you think are doing something interesting in business books that you think will make a good guest on this show for the future. Who do you think would be good? Malcolm Durham: I would like to introduce you to Andrew McNally, who I met through my work at the think tank reform, which we were both supporters of. He wrote a book called Debtonator, talking about how this addiction to debt is not a great idea and people need to understand that equity is where the wealth is. Alison Jones: Okay. Thank you very much for that recommendation. That’s brilliant. Finally, if people want to find out more about Wealthbeing in all its various forms, where do they go? Malcolm Durham: www.wealthbeing.co.uk. You’ll find us there. You can join the community. You can read the blogs. You can contact us. You can buy the book, and you can start to converse with us and see where you want to go with it. There are guides, myself, and mentors, Wealthbeing guides, I need to get the terminology right, between the book to the people. You can engage with us and we will spend time with you as well thereafter to help you grow a business, look after yourself, and enjoy wealthbeing. Alison Jones: Fantastic. Thank you so much, Malcolm. That was a great concept and a really fascinating interview. Thank you so much. book, Malcolm Durham, publishing, wealthbeing, writing. Bookmark.